New Kicks! Hopefully, the third attempt is charmed. – What the hell are they doing now? For those playing along at home, I’ve been on a multi-year quest for the perfect, let alone durable, bikepacking/singlespeeding shoe. My requirements aren’t many but they seem to be really tough to combine into a durable shoe. Needed is a shoe that’s stiff enough to not bruise my foot when riding but flexible or shaped well enough, to allow me to walk/hike when I need to. To me, it honestly doesn’t seem all that difficult. Well, given that this is the third shoe from the third manufacturer, it apparently is more difficult than I think. Today, I bought my third pair of shoes in this quest. 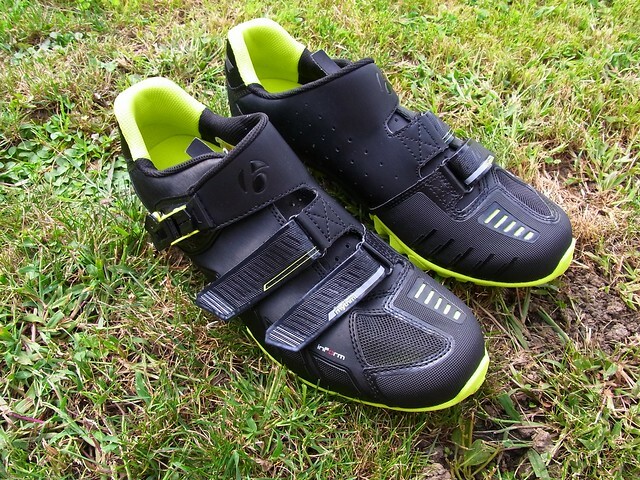 They are a pair of Bontrager Rhythm mountain bike shoes. The Rhythm is listed as Bontragers attempt at an Enduro shoe. They fit like a normal mtb shoe and not like swim fins that most enduro shoes seem to fit like. I digress here…. A stupid question. Why does needing to walk mean that the width of the shoe has to change in terms of the last? It makes no sense to me. My running shoes aren’t wider than my other shoes. That’s a ridiculous premise in my view. 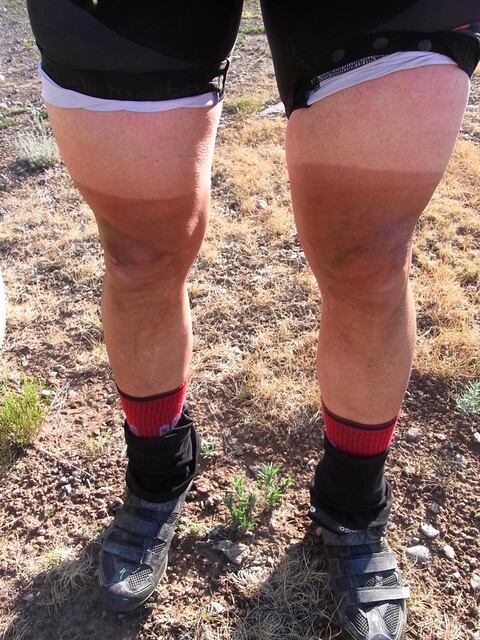 I started with the Specialized Rime in ’12 for the Tour Divide. While, for the most part, a really nice shoe, it had 3 problems. 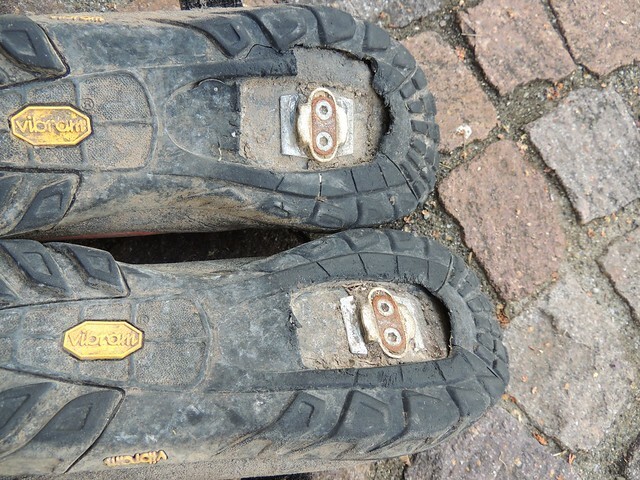 First, even though it was rated as a 9 on a 10 point stiffness index, I often ended up with bruised feet as the sole flexed, vertically, quite a bit and the Vibram sole was too shallow (2nd problem), thereby causing the cleat to press into the sole of my feet as I walked. Lastly, the sole delaminated (3rd problem) and looked almost identical to the soles of the recently returned Giros. Interestingly, both had Vibram soles. Maybe it’s Vibram and the way they attach the sole rather than the shoe manufacturers. Hmmm. I then moved on to the Giro Terraduro. The shoes were purchased from HiBike.de in March but it was early May before I finally received them due to HiBike’s disaster of an inventory and shipping system. The shoes looked great and felt quite good, in spite of being a wide shoe. Interestingly, the Privateers I tried on, were good fitting shoes but the odd idea equating walking to the need for a wide shoe was put into play here. What gives? Anyway, the Terraduros felt pretty good and had enough adjustment to get them to fit comfortably. The soles were also stiff enough to ride comfortably and walking was also comfortable. Sadly, after 3 days of my recent Alpencross, they also delaminated. If that wasn’t enough, chunks of the sole started to break off as well. When I returned from the trip, the shoes were promptly returned to the aforementioned shop for a full refund. This led me to the Bontragers or the Mavic Crossmax shoe. The Mavic Crossmax was found online but not locally. It is, however, on the same last as the Alpine XL which I tried but the fit was rather odd. Length and width wise, it was o.k. but it was too tall in the middle of the foot which I really didn’t like. That left me with the Bontragers. Luckily, Kera had recently found a good shop in Adliswil close to her work called Move On. They’re mostly a Trek shop but they also carry a number of other high-end brands and they stock a large supply of quality aftermarket parts, SRAM, clothing, etc. Additionally, they’re really helpful (something rare back in Germany). So, after trying on a similar shoe, I ordered the Bontrager Rhythm. Today, I reveived an SMS from the store saying my shoes were in. They’re in my hot little hands now. They fit really well in width and length with nothing odd. Having said that, I had to size up to a 46 from a normal 45 or 45.5 as it runs a tad short. After mounting the cleats, I did a quick ride around the neighborhood and they feel really good. There’s very little vertical flex when pedaling and I can walk quite comfortably. Also, the sole seems to have a lot of grip. I suppose, only time will tell whether my pair of magic slippers. Wish me luck! Hope the new shoes work out for you! Hi from Giro! We’re sorry to hear you had issues with your Terraduro shoes. For insight on what happened, please visit this link: http://www.giro.com/us_en/statement-from-giro-regarding-terraduro-shoe-delamination/. We hope you’ll give them another try!